The structure in the wide valley of Upper Nitra consists of an originally medieval castle on a travertine hill. 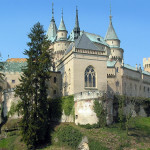 The Gothic, Renaissance and Baroque modified castle was radically rebuilt at the turn of the 19th and 20th centuries. The impulse behind the Romantic rebuilding emerged from the cultivated art-loving former owner Ján Palffy. The implementer of the construction, the experienced architect Jozef Hubert, incorporated the valuable originals from Palffy’s rich art collection into the interior. For the architectural and artistic elements he freely drew designs from medieval buildings in Italy and France. As the castle is one of the most popular tourist destinations, some of the original furnishings have been made available within the museum exhibition.